On the Winter Solstice of 2012, the center of the galaxy will helically rise with the morning sun. According to scholar John Major Jenkins, this moment marks the end of the Mayan calendar. 3 Strangely enough, the Cross of Hendaye, also appears to be indicating this same general time frame. Both of these ancient chronological systems appear to find great importance in the helical rising of the center of the galaxy in 2012. The enigmatic French alchemist Fulcanelli, in his classic Le Mystère Des Cathédrales unquestionably tells the reader that the Cross of Hendaye is marking the end of the Iron Age, the last of the Four Great Ages. 4 According to ancient lore the Iron Age is an Age where the world turns to steel, black magic becomes religion and Men lust for control and dominion over both human beings and the very earth itself. The earth, the air and the water become polluted. Wars, famines, and plagues envelop the human race. Time itself speeds up until exhausted, the world and the Age come to an end and a new cycle begins. These are many of the events that also occur at the end of each of the Second and Third Ages of The Lord of the Rings for each is in essence a microcosm of the entire cycle. Tolkien uses this concept of the upheaval that occurs at the end of each Age as his backdrop to the story of Frodo and the Ring. These Four Ages according to Fulcanelli, the Cross of Hendaye and many ancient texts, are mapped by the twelve signs of the zodiac. Like the numbers on a clock the Golden Age begins when the hand passes the twelve. The next age, or Silver Age occurs when the hand passes three, the Bronze Age, or Third Age, begins when the hand passes six and the Iron Age, or last Age begins when the hand passes nine. Each of these four quadrants is marked by one of the main signs of the zodiac, Scorpio, Taurus, Leo and Aquarius. 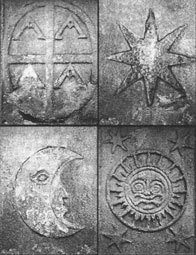 Perhaps this fact is not well known to all of you but the twelve signs of the zodiac are actually marking the process called the precession of the equinox. The earth is tilted in space at 23 degrees. It wobbles slowly on its central axis like a spinning top. 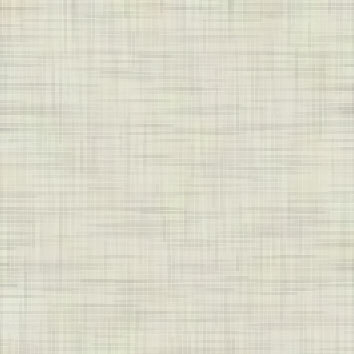 This backward wobble is so slow that it takes 72 years for it to pass through one degree of the circumference of the wobble. In other words, if a certain star such as Sirius was rising over a certain point, say a nearby mountain peak on the day you were born, it would take 72 years for the rising of Sirius to move one degree away from that same point on that same day of the year. The fact that the stars were not fixed in the heaven but were slowly moving backwards is not only central to understanding the alchemical thesis but was perhaps the greatest single secret being taught in the mystery schools of Egypt, Greece and India. The common exoteric knowledge was that the sky was fixed and unchanging. But the adepts and esoteric masters knew that even the heavens were in motion. Since the movement of the stars was so slow the only possible way to map the precession of the equinoxes was through many generations, each successive generation continued this extensive and valuable work. Slowly, over many centuries, the exact map of the precession of the equinoxes was drawn. These clever priests/scientists/initiates had come to realize that it took an enormous amount of time, approximately 26,000 years, to go through one complete precession. So they divided up the nearly 26,000 yearlong cycle into twelve segments affixing a zodiacal 'month' to every 2,160 years in each of the signs. Therefore, if you begin your precession count at Aquarius it will take twelve times 2,160 or 25,920 years for Aquarius to return to its original position again. 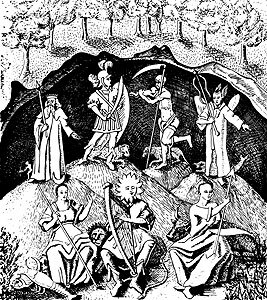 Using a combination of observation, meditation, contemplation and discussion, the initiates of these Mystery Schools chronicled human behavior patterns, plant cycles, animal behavior, and a sundry of other physical, emotional and mental occurrences, signs and portents that allowed them to recognize the unique nature, quality and characteristics of each of the twelve signs. From their observations they became aware that each place on the giant zodiacal clock brought forth its own traits and manifestations just as high noon is different than sunrise. They also noticed that at the cusp of the four great signs these changes in behavior, growth, etc. were more clearly pronounced. Indeed, it appeared to them that each of the four aspects of this great cycle actually brought forth different types of beings, different types of behavior. They also observed and chronicled the changing relationship of humanity to the physical and spiritual dimensions of reality noticing that as the Ages unfolded, the world and its beings were actuality densifying. As a result of this densification, with each successive Age, humanity began to focus to a greater and greater extent on the material world and lose touch with the more subtle realms of spirit. 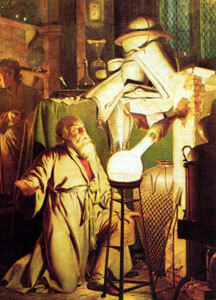 The knowledge accrued from these observations eventually became known as the Sacred Science of Alchemy. To describe the unique qualities and attributes of each of these Ages, these Sacred Scientists used the symbolic language of metals - gold, silver, bronze and iron. Interestingly, these four metals gain molecular density as they move from gold to iron. So it would seem, according to this paradigm that as the Four Ages unfold, gravity is increased and the packing of molecules becomes denser. And now, if the Cross of Hendaye, the writings of Fulcanelli and the work of John Major Jenkins, as well as our own research into Alchemy and Tantra is correct, we are at the end of the Fourth Age, the Age of Iron. But what does this really mean? Is it the literal 'end of the world' as chronicled in mystical texts from the Book of Revelations, to the Corpus Hermeticum of the alchemists, to the Tantras of India, and the teachings of Shamanic cultures throughout the world? Or does it indicate a time of great change and renewal? If, the ultimate alchemical goal is the transformation of lead into gold, then the end of the Iron Age can only herald the dawn of the Golden Age. This is the Age when the fulfillment of humanities true purpose on earth and the full flowering of the primary vision of the Creator becomes manifest. For as any alchemist will tell you, out of the depths of darkness comes the greatest light. Upon reading The Lord of the Rings, The Silmarillion, and other works of J.R.R. Tolkien, it is clear that these questions gave him much fuel for contemplation. There are so many parallels between Tolkien's work and alchemical knowledge that one cannot help but surmise that he must have been aware of this ancient view of the Ages with its unique perspective on creation, history and the pre-history of humanity and deftly wove it into the very fabric of his tales. His epic tale The Silmarillion presents Tolkien's cosmology from the beginning of Creation to the Third Age of Middle-Earth. The Lord of the Rings trilogy is really a documentation of the transition from the Third Age to the Fourth. According to the alchemical lore, the period that we consider 'history' equates with the beginning of the Fourth Age, or 6,500 years ago. Myths and legends that concern the events and experiences that happened prior to this time period are said to have taken pace in 'pre-history'. Tolkien states that imaginatively his 'history' is supposed to take place in a period of the actual Old World of this planet. 6 Interestingly, this is nearly the same time that Tolkien dates the events that unfold in The Lord of the Rings.